We now have Digital Key. Pick your room and check yourself in - all from our app. Enjoy views of the New York City skyline as you relax at the conveniently located Hilton Hasbrouck Heights/Meadowlands hotel. 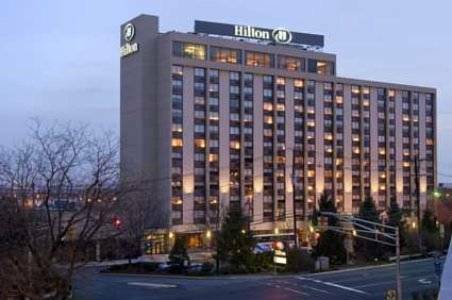 Situated close to key Northern New Jersey destinations such as Teterboro Airport the Meadowlands Complex Hackensack University Medical Center and the Izod Center the inviting Hilton Hasbrouck Heights hotel is also just a short drive from the excitement of New York City. Whether you are sampling our casual American cuisine at Bistro Six Five Zero keeping up your exercise regimen at our state-of-the-art fitness center enjoying our seasonal outdoor pool or prepping for a meeting in the 24-hour business center our friendly and dedicated staff will make sure your stay at Hilton Hasbrouck Heights/Meadowlands meets every expectation. Our experienced team can also help you plan a special event to remember. From our IACC-certified meeting spaces to our sky-level ballroom with sweeping views of New York City our Hasbrouck Heights hotel offers a large and welcoming space appropriate for corporate events and storybook weddings. Come enjoy our welcoming atmosphere comfortable accommodations and exceptional value. A CREDIT CARD GUARANTEE IS REQUIRED ON ALL RESERVATIONS REGARDLESS OF ARRIVAL TIME. INDIVIDUAL PLANS MAY VARY. PLEASE SEE CANCEL POLICY FOR CANCEL PROCEDURES OF A GUARANTEED RESERVATION. RESERVATIONS MUST BE CANCELED 24 HOURS PRIOR TO DATE OF CHECK IN TO AVOID A PENALTY OF ONE NIGHT ROOM AND TAX CHARGE. *NOTE-INDIVIDUAL PLANS MAY HAVE VARYING CANCELLATION POLICIES. ~9 miles from Hasbrouck Heights.